Building a house without modern technology such as power tools, running water, or electricity can be a difficult process. Building a house in colonial times without modern technology is even harder! The kindergarten students in Mrs. Morse’s kindergarten class at Virgil Elementary are exploring how people in colonial times built houses. Students learned what a bricklayer, mason, and carpenter were in a colonial town. 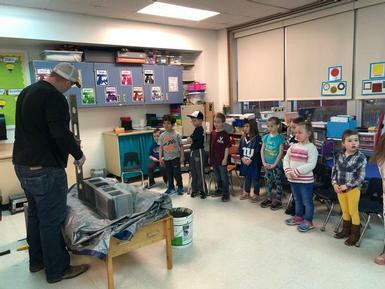 Students also learned how to identify the tools used by bricklayers, masons and carpenters. Mrs. Morse’s son, Britt Morse, a Cortland School Class of 2005 alumni, happens to be a skilled mason. Britt came to show the kids the tools of masonry and demonstrate how to build a wall. Using tools such as a striker, trowel, hammer, cinder blocks, level, string, and mud, Britt easily built the wall. The mud was mixed in a bucket and the trowel was used to spread the mud on the cinder blocks. Taking turns each student came up to use the trowel and spread the mud. Questions that were asked by the students included how to make the house level, where to go to school to become a mason, and where the cinder blocks are made. Students also made butter earlier in the week, as part of their continued study of colonial towns.